The Original Backnobber II :: Pain Management :: The Pressure Positive Co. Manufacturer: The Pressure Positive Co. The Original Backnobber®II massage tool is constructed of durable, fiberglass reinforced Nylon. 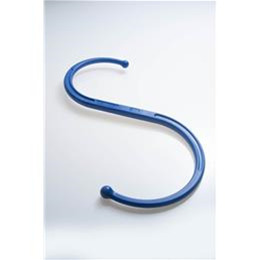 The Original Backnobber®II is used by hooking one of its curves over a shoulder or under an arm and using its leverage to apply firm, deep pressure to knots in the muscles of the neck, shoulder, upper and lower back and to nearly any other location where muscle soreness may occur. It can be broken down for easy travel and storage and comes with a fully illustrated 36 page User Guide. Proudly Made in the USA. Assorted colors.